Gross. Stadt. Jagd. 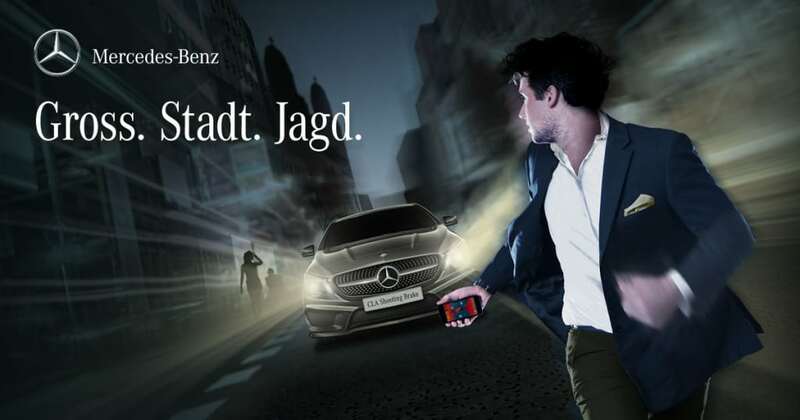 (meaning ‘Urban Hunt’ in German) is a multiplayer GPS game that took place in Zurich, Switzerland, on Friday 29th May at 8pm local time. G.S.J. was designed by JEFF Communications to promote the new Mercedes-Benz CLA Shooting Brake. The game saw several thousand players running the streets of Zurich in a 1.5 hour game of last-man-standing. The last person to remain alive by evading capture by the Hunter (an actual CLA Shooting Brake being driven around town) went home with the luxury sports car. Below is a video reportage of the game, which was played through a mobile app featuring GPS checkpoints, safehouses and power-ups illustrated on an in-game map. I decided to interview the winner, Markus Liechti, on a sunny day in Zurich a week after the event to discuss his experience playing G.S.J. Markus’ story makes for a particularly interesting read because he is a long-time semi-professional board game enthusiast and captain of the Swiss Warhammer 40k National Team. In the following interview we will learn how Markus applied his strategic thinking to gaming in the real-world, and discover many useful tips for designing mixed-reality GPS games. [Interviewer—Chris Solarski] Hi Markus. Thanks for taking the time to do this interview. Before we get started, please can you tell us a little about your gaming experience. [Winner—Markus Liechti] I’ve been playing board games since I was a little kid. At one point I discovered pen and paper role-playing games (RPGs) at around the age of 10. Dungeons and Dragons, to be exact, which I often played in a club alongside as many as 20 players. At one point a group of 8 of us splintered off to play Games Workshop’s Warhammer 40K, which was the most incredible game that I’d ever played. At that time I’d never heard of such games. War-gaming was virtually non-existance in Switzerland—just after Warhammer had first been published around 30 years ago. [Chris] I also know that you play Blood Bowl competitively. Is that right? [Markus] Yes, Blood Bowl came later, which I enjoyed because it’s very strategic and tactical, and doesn't require as much preparation time as Warhammer 40K. Since then I’ve also been playing video games like Civilization (one of my favorite games), and Age of Empires. [Chris] So you went from playing in groups of 8-20 players around a board game to playing G.S.J., which featured several thousand players playing in an augmented real-world. In a previous conversation we’ve had you mentioned having a strategy for G.S.J. Can you tell us a bit about it and, perhaps, how it relates to your board-gaming experience? [Markus] Yeah, I did have strategy. This was different. Because I made sure to study all the rules but I couldn’t really predict how the game mechanics worked because I’d never played something like G.S.J. I didn’t know whether winning will be determined by luck; whether you need a strategy; or that you prepare a great strategy but the Mercedes’ [the Hunter] catches you and you die without the ability to react. I had a basic strategy that was initially to stay on the edge of the gaming area. But I then thought that this would be boring because I could potentially be standing around for 2 hours doing nothing, and this was probably a strategy that other players will do too. If other people have the same strategy it’s all luck at the end. The playing area of Gross. Stadt. Jagd. defined by a red, no-go zone, which gradually shrank as the game progress. Featured here are predefined GPS checkpoints and safehouses. I though to myself: alright, I’m not usually very lucky based on experience with dice rolls [laughs]! So I studied the game map on my mobile phone to determine what to do. The other option was to walk around and visit the pre-defined GPS checkpoints, particularly ones that were close to each other. So I decided to start the game next to a checkpoint to collect the power-up reward for checking-in before continuing to the other locations. [Chris] So you mapped out a route in advance? [Markus] Yeah, but just short-term goals. I would visit 3 checkpoints and then try to hide somewhere—perhaps close to a GPS safehouse where I will be protected. [Chris] Does that in any way mirror a strategy that you apply to board games—thinking 3 moves ahead? [Markus] Yes, yes! You always have to—especially if you compare with Blood Bowl, and Warhammer 40K. You must have a basic strategy but then your opponent moves and you must react and likely adjust your initial strategy. And that’s what I also had to do in G.S.J. I did three checkpoints and then saw that there was no immediate threat from nearby GPS tornadoes, or the Hunter, and the gaming area was still big. So I decided, OK, I’ll do the other checkpoints because I have plenty of time. Maybe another thing worth noting in G.S.J. you had face-to-face contact with real players, which you don’t experience with online strategy games, for instance. You may have allies but you don’t generally communicate with your opponents. In G.S.J. you knew that only one person is going to win, but you still talked and shared strategies with other players that you encountered in the streets during the game—comparing and adjusting your initial ideas with each new piece of information. This is something that I also experience in games like Risk. In Risk you also form alliances with other players to fight a common rival but you can only afford to do that if you can be certain that your particularly strategy will be better for the end game than the one of your allies. [Chris] So you saw a clear conceptual difference between the Hunter—the ultimate enemy in the game—and rival players. [Markus] Exactly! With the Hunter, I knew that it’s a human driving the car, or if it had also been AI, I could predict that it would be programmed to go where the majority of players are located. So I tried to stay away from such hotspots. And also stay at the border of the map because I thought, if I’m by myself at the border, it’s more of an effort for the Hunter to drive there to capture just one player. Perhaps I also have an invincibility power-up and the Hunter cannot even kill me. I therefore felt safe there, predicting where the Hunter would likely go, while also being on top of rival players by learning from their strategies. Some players gave me very useful tips about the safehouses, about their activation range and that you could leave them and still be protected. [Chris] Your knowledge of the rules was therefore refined as you played the game. [Markus] Yes! You share some of your ideas with rival players, and get some ideas back. That also involves a lot of diplomacy. Maybe you only share information with casual “fun” players who don’t appear to be as competitive as I am [laughs]. I thought, it’s safe to share my strategy with these players and maybe get valuable information for myself, which I can turn into a victory. Meanwhile they may last just 5 minutes longer. [Chris] Risk indeed seems to be the traditional board game that best mirrors your experience playing G.S.J. because you had this selective process when deciding which rival players to approach. [Markus] Yeah, you talk briefly and there it was very diplomatic too because you must figure out whether they have GPS bombs too. You don’t want to walk towards a player and then have this person drop a bomb and you die. So you had to find such things out, and also bluff by saying that you had a bomb too saying: if you drop your bomb I also drop mine. [Chris] Perhaps we can frame the talk in terms of Dynamic Composition [which readers can learn about in my Gamasutra article titled, The Aesthetics of Game Art and Game Design] and discuss the individual elements of the G.S.J. in the context of this game design tool. In terms of character shape, board games feature a lot of character customization. You may spend weeks or years decorating figurines and assembling your perfect set of characters to compete with. How does that compare to G.S.J. were you are the actual character running around a real-world city? Because there were all types of people competing: families pushing babies in a pram, athletes sporting high-tech jogging equipment, students, businessmen, etc. Did you take on a player identity for this particular game, or did you just go as yourself? [Markus] It’s actually funny that you bring that up. On arriving at the contest I saw many people running in high-tech jogging suits and shoes. I didn’t think anybody would bother to make such an effort. It was late in the evening. I thought it would be cold but turned out to be super hot that day. I was wearing long trousers and a polo shirt, which made me feel different than all the other players. So this gave me the feeling of being the underdog. Prior to this I felt that I was prepared because of this strategy thing, but then I realized that I’m actually not as prepared as I should be. I decided that this would be the basis of my excuse should I lose—that I sweated to death, or something [laughs]! [Chris] The significant change to your identity as a player happened upon arriving at the event—on first seeing how well equipped rival players were. [Markus] Yes, that also gave me additional motivation. Like when I see that my opponent in a game of Warhammer 40K doesn’t care if they win or not—it reduces my motivation. Winning doesn’t feel as rewarding. For that reason I like to play against other competitive players. [Chris] It was the Hunter that was the ultimate enemy in the game, and the most prominent entity on the in-game map. But it seems that you were more concerned by rival players. [Markus] I knew the Hunter caused the most damage but it was also the one opponent that was the most predictable. I was more afraid of randomness, like the GPS tornadoes that swept across the playing field. You could always check to see where the Hunter, while all the rival players could be carrying bomb power-ups that could be dropped at any moment. [Chris] Going back to the topic of Dynamic Composition, let’s discuss character animation and player gestures. For instance, how did your movement change as travelled through the city? Did you do a lot of running, or predominantly walk? [Markus] I could see how fast the cars were moving. I could see how fast the GPS tornadoes were moving across the in-game map. And I knew how fast I can run without receiving an in-game penalty for speeding. [Chris] I find that very interesting because you were assessing real-world factors to actively calculate the parameters of the game. [Markus] That’s actually true. At one point in the game I remained in one spot for quite a long time because it seemed safe close to [Zurich’s technical university] ETH. And why I went there was because I knew the area well—I studied there. Other areas of Zurich I did not know so well. I was familiar with the roads in that area, where cars can pass. There is a one-way road at that location, so I knew from which direction the Hunter would potentially approach. And from there I could run in many directions where a car couldn’t follow. Also not many players were located there. It was better than standing on a bridge where you only have two directions in which to run away. [Chris] Can you see a link to board games in relation to how you moved around the city in G.S.J.? [Markus] Yeah, like in Risk, when you’re in Europe you can go in every direction. You can also be attacked from every direction. While if you’re in a border state somewhere in the south-west there is only one way you can go but you only need to defend one border. So in G.S.J. it was a combination of the location together with the speed that I knew that in three turns I could run away if the Hunter came close. [Chris] So in terms of Dynamic Composition and pathways, you had these various routes of escape to consider. Did their shape—being in an area with heavily clustered streets versus being in a park, for instance—affect the gaming experience and your physical movements? [Markus] Yeah, definitely! The location near ETH meant that I had a high vantage point over the city. I didn’t want to find myself at the bottom of the hill and realize that I must run upwards because then I would be super slow. And, as I mentioned, I also felt safer because the Hunter had reduced access to the streets around ETH . It’s just like in Warhammer 40K where you also have advantage when being on a hill because you have a better line-of-sight when you shoot at someone. When you put your models on top of a ruin, for example, you know that tanks or cavalry will not be able to run you over because they cannot climb up. So this reduces the number of threats significantly to shooting attacks and climbing infantry models. [Chris] This was probably one of the first occasions where you physically acted out the role of an infantry model but in a real-world setting! On the topic of line-of-sight, did you ever make eye contact with the Hunter before you were announced the winner at the end of the game? 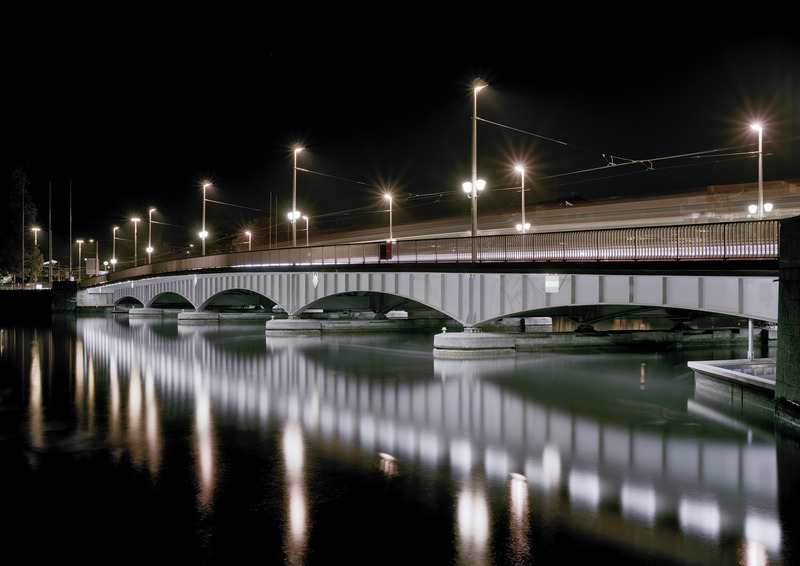 Quaibrücke bridge in Zürich created a sense of vulnerabilty because it limited the escape routes to running in just 1 of 2 directions. [Markus] I did once, the car passed me and I lost a lot of health points because I was at Quaibrücke [the first of several bridges that span the Limmat river, which run through the city of Zurich]. I could only run left or right but luckily the Hunter passed me going in the opposite direction, so it passed very quickly. But I was otherwise never really close to the [Hunter] car. [Chris] Was the Mercedes-Benz car that represented the Hunter visually distinguishable as a game entity? Did it look threatening like an end-of-game boss in a typical video game? Personally I think that the car’s dark-grey color and sharp lines gave it an edgy appearance. But ultimately the car blended in with the regular traffic. [Markus] Perhaps I was too focused on the in-game map to notice so I didn’t spend much time to look up to check if I can see the Mercedes’. But, to be honest, it blend in with the other cars on the roads. [Chris] I suppose, the Hunter’s function as the enemy was visually communicated better through its red icon on the in-game map. The in-game map displaying the Hunter radius (Merdecedes_benz logo), checkpoints, safehouses, power-ups, and rival players (white dots). [Markus] Actually the Hunter felt like a stronger threat toward the end of the game because at the beginning, I thought, this car is randomly hunting one of the 3000, or so, players. So it’s not like it’s your direct opponent. The Hunter even helps you eliminating the real players who are like your human shields [laughs]. So at the beginning you can see the Hunter as your ally until you’re the last player. At the end the Hunter becomes the hardest opponent. [Chris] It steadily becomes a head-to-head rivalry with the Hunter as the game progresses—becoming a more predictable and harder opponent. It seems that the atmosphere and competition that you experienced was predominantly through the activity on the in-game map. [Markus] Exactly. That’s exactly how a board game works. The only difference was that you played the game on your iPhone [or Android] phone but you could think of the in-game map as a board game. Instead of moving your little pieces a certain amount of inches, like in Warhammer 40K, you just have to move yourself. [Chris] The last element of Dynamic Composition is the design of the game’s environment. G.S.J. played out in reality so aesthetic design choices included hosting the game at night to create a slightly more ominous atmosphere. Where there other environment factors that affected your experience of the game, like passing through Zurich’s red-light district versus being camping up at the ETH university? [Markus] Yeah, there were several factors. When I was in the town center, I could see everybody running around and felt happy because of the feeling of a shared experience—people having fun playing this game. [Chris] And I suppose the heavily clustered streets in the city center also gave you a feeling of relative safety. 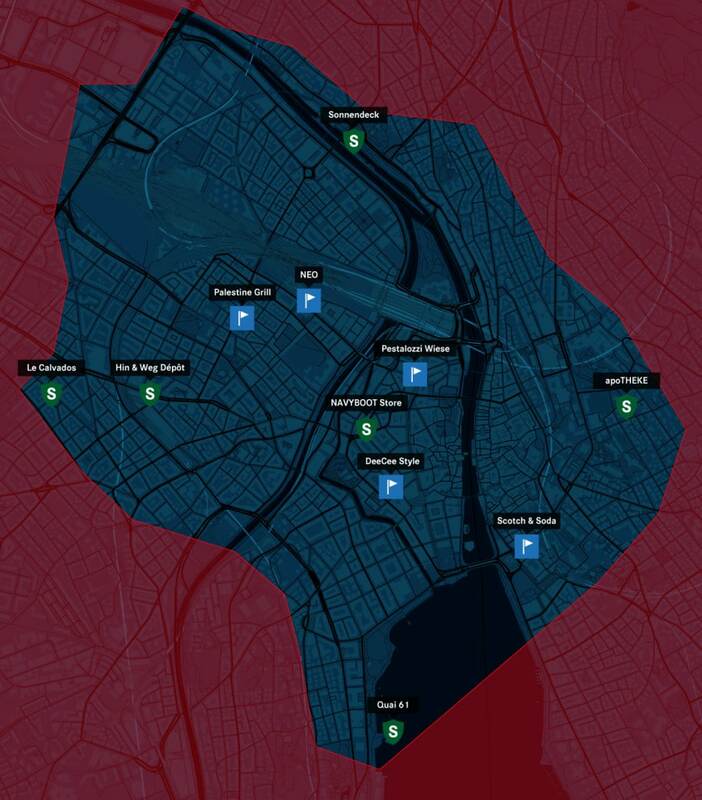 [Markus] Put it this way, if the game allows you to see your opponents on the map, then clustered streets are better because you have many options to run away. If the game hid the positions of rival players then clustered streets would make it difficult to see enemies approaching until the last minute. So I felt more comfortable in heavily clustered streets that had many small junctions where you can zigzag like a rabbit to escape [laughs]. [Chris] So you felt more vulnerable in big, open spaces. [Markus] Yeah, definitely, like on the bridge where my routes of escape where limited. [Chris] Going back to the question of aesthetics, did the various districts within Zurich contribute to the overall experience? [Markus] I think so. It was really a mixture of several things. Near the end of the game I was close to the Dynamo complex—a relatively quiet spot near the river. It was also night and it felt kind of weird because everybody else in that area of chilling out, having a beer, oblivious to the game taking place. These people were probably wondering who is this crazy guy running around with his phone looking for the checkpoint code. But I did not care what people were thinking of me because of all the adrenaline. [Chris] There were shifts in mood depending on your location. When you were by the quieter area near the Dynamo you felt that people could more easily identify you as an outsider. [Markus] Exactly, because in the city center everyone is running around and then you blend in more, even though the Hunter only sees you as a single spot on the in-game map. You yourself feel more comfortable if there are other freaks [laughs] around doing the same stuff as you. [Chris] Perhaps going back to your experience playing RPGs. Did you perceive any similarities between the role of a pen and paper games master, and the team of games masters managing G.S.J. in the background? [Markus] I think there was a slight advantage playing G.S.J. over pen and paper board games. Because I have a fairly good intuition for how gamers think so it’s perhaps easier to predict how Hunter will behave, for instance, if I put myself in its shoes. So I didn’t feel the presence of the team acting as games masters. More the driver of the Hunter vehicle. [Chris] The game was not entirely anonymous, since you could click on the player icons and see each person’s username. I believe that you used your player tag, Jokaero. Do you think it would have been better to ensure that everybody was completely anonymous? [Markus] Complete anonymity would have been fairer because it ensures that everybody is on an even playing-field. But, as a gamer, especially a competitive player, I play for the prestige. Then it’s kind of cool if I’m one of the last of five players left and everybody can see my gamer tag. It’s like getting lots of likes on Facebook. [Chris] If you were playing a second iteration of the game would you wish to see even more possibilities for player customization—other than just the possibility to enter your username? [Markus] Yeah, it would be cool to give more personality to the white dot [that represented each player]. Maybe add an avatar, or something, to give yourself a unique identity. Because in most games I think it’s your gamer identity, your alter ego, more famous instead of yourself. [Chris] Are there any last thoughts, or wishes for future iterations of the game? [Markus] I love statistics. For example, not even during the game but at the end of the game it would interesting to look at statistics. The time the most players died? How many bombs were used? I love reviewing things like this because they might give me an advantage for the next game. It increase the engagement of players after the game has already finished. On the other hand, I like complex games but they shouldn’t add unnecessary information or complexity. I don’t want to win a game just because I know the rules better. So I think the game offered just enough information so new players were not overwhelmed. The mix was really good. You could consider adding more complexity when everybody has played the game at least once. Add new power-ups or even gameplay that encourages collaboration and the formation of alliances. I think that was actually the only thing that was missing—some sort of gameplay incentive to make alliances. I met several groups made of five players and they moved around together. And I thought that it’s actually fun to run around with friends. But you know that the Hunter will eventually go for you because you’re an attractive target if you’re composed of five people. In the end only one person can win. [Chris] That’s a funny thing to point out. The more friends you have the more attractive a target you become for the enemy. [Markus] Oh, yeah, I always thought when I saw these huge groups that it was cool to hang around with them so you could chat with them and share tips. But eventually I would leave the group to protect myself and not attract too much attention from the enemy. [Chris] You’ve provided some great insights into the gameplay experience of G.S.J. Thank-you very much for your time and congratulations on the incredible win! Markus Liechti will be captaining the Swiss Warhammer 40k National Team at the annual Warhammer European Team Championships, which in 2015 take place in Prague this coming August. Please feel free to say hello if you're attending. Chris Solarski is an artist game designer and author of Drawing Basics and Video Game Art (Watson Guptill 2012), which has been translated into Japanese, and a Korean edition is on the way. For more information about Gross. Stadt. Jagd. please visit the official event website.